What Is The Best Farrier Rounding Hammer On The Market? As a farrier, good tools are essential to make sure you do the best possible job for your clients. Having good tools to shape the feet is the first part of the equation, and the right equipment for shoeing is equally important. Rounding hammers are used for shaping the metal of the horse shoe, and the round face is excellent for drawing out steel much faster than a flat faced hammer. These specialist hammers do also have a flat side though, and this, as well as the edges, is used in the shoe shaping process. Rounding hammers are available in a huge variety of shapes and sizes, so how to find the best rounding hammer for you? This rounding hammer is made by a world renowned company, which specialise in shoes and shoeing equipment, meaning that you really are buying the best, high quality product made for the job. The hammer is lighter than others on the market, making ideal for those with a smaller stature or smaller hands. Can be used on hot or cold shoes – Unlike some rounding hammers, this one is versatile enough to be used for hot or cold shoeing. Beveled faces – This attribute is a great one, as beveled faces reduce the risk of chipping the metal shoes. You will save money on wasted shoes, and prevent frustration at the same time! Quality hardwood handle – Having decent wood for the handle is a must for a good rounding hammer. You don’t want the handle giving way mid swing! The hardwood handle should last for years, and it is fitted tightly to the head, meaning there is no risk of it coming loose. Two faces, one flat and one round – This increases the versatility of the hammer, and means that you can easily switch sides depending on what you want to do with it, without switching tools. The handle lacquer is not to everyone’s taste – This hammer comes with a well varnished handle, which some users prefer to remove and substitute for rubbed linseed for a worn, warmer look. This is a fantastic hammer which will last you for years. It is small enough for intricate work (or Shetland shoes!) and will become your go-to tool for rounding in no time. A good, weighty rounding hammer with an ergonomically designed handle, this one is great for professional workmanship and quality shoeing. A good price for what it is – You usually end up paying through the nose for quality, but not in this case. You will receive a great rounding hammer for a fraction of the cost of some of the others on the market. Solid and very well made – When you buy a hammer, you want it to be strong and long lasting. This one ticks those boxes, especially with the handle being so tight to the head. You won’t need to worry about it unexpectedly flying off! Two useful sides for different types of work – Having a rounded and a flat side is very handy, in case you need to switch working styles quickly. This one has a beautifully rounded end along with a flat end that is, well, flat. Comfortable handle with good leverage in different places – When you have a good handle that affects the movement of the hammer depending on where you grip it, you know you’re onto a winner. This one does just that, meaning that you can keep using it for whatever application you are going for. The handle may be suited to a lighter hand – It has been suggested that the handle could be a bit more weighty, to suit the heaviness of the head. All in all, this is a great hammer. Well made and highly functional, with two useful sides and a comfortable handle that sits nicely in the hand. A US based product, this one has arrived on the market based on years of research and hard use in the field, to make it a stand out product that is useful and functional as a farrier’s tool. Well tested and treated – This hammer has been heat treated and fracture inspected, meaning that the end product you receive is as strong and durable as you could possibly wish for. A light hammer, perfect for smaller hands – If you need a hammer for lighter work then this is the one for you. It still packs a punch though! Round and flat surfaces for a change of working – Having both a round and a flat surface is exactly what you’re looking for in a versatile tool. You can use it one way for rounding, and the other way for pounding! High quality and well made – Good workmanship is essential for a tool that you will be using day in, day out. This one ticks all those boxes. 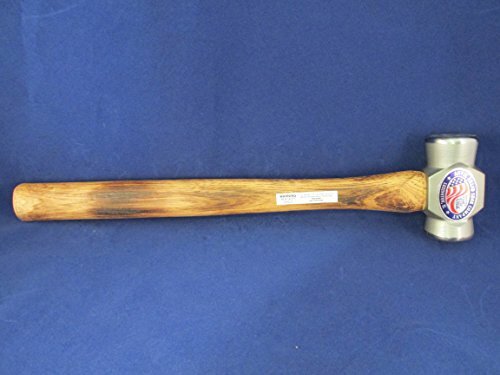 It is a little longer in the handle than some – Having an extra long handle may suit some people, but others have reported that they have had to shorten the handle to make the hammer more functional. This is a good, strong hammer that does exactly what it says on the tin. It is perfect for rounding and flatting, and has quickly become a favourite among blacksmiths. A good rounding hammer is an invaluable tool in any farrier’s kit. It is essential for rounding shoes, and having a good hammer can save you hours of toil and many dollars in replacements. Finding the best farrier rounding hammer can be tricky, but have a look through the above and see if you can find the best one for you.